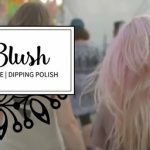 You are impatient to know the release date of Oh Blush dip powder nails. To help you wait, watch the tesaer of Oh Blush. You'll discover a little bit more the application method, but not too much, we reserve more for later. ← Dip powder nails Oh Blush!